Pianoforall is one of the most popular and respected piano courses on the web. Online since 2006 it is always amongst the first choices of anyone wanting to learn piano. 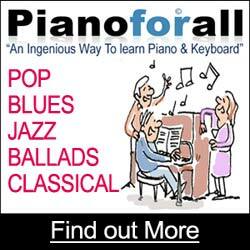 All styles of piano covered – pop, blues, jazz, ballads, improvisation, classical. 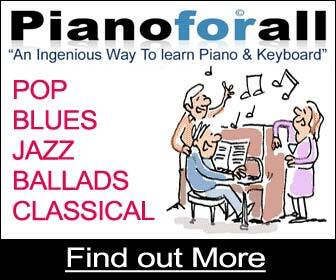 Pianoforall converts well because people trust that the course will deliver. The course has probably the best testimonials of ALL the online piano courses. What sets Pianoforall’s testimonials apart is that they are VERIFIABLE – potential students can request email addresses and talk to that person to find out for themselves if pianoforall delivers. The Pianoforall Program offers you an incredible 60% commission on all sales. If the customer doesn’t purchase on the first visit, Clickbank’s’ sales tracking cookie is active for up to 90 days. Keep in mind that a large percentage of people order the DVD ROM version because many people don’t like downloading or they want a back up DVD. Look at the income you could make even if you make just ONE sale a day! Pianoforall is such a fantastic course the refund rate hasn’t gone above a 4% average since 2006 so your hard earned sale will be very secure! Just look at all the glowing testimonials and you will see why we rarely get asked for a refund. You never have to worry about getting paid. All payments come from Clickbank, the most trusted 3rd party affiliate program manger online. You get paid by check or directly into your bank account weekly or bi-monthly and everything is fully automated. Once you setup a Clickbank account you can log on and see how many people you have sent to our site along with your sales and commissions. Not already a member of Clickbank? If you aren’t already a member of Clickbank you will need to sign up before you can get your hoplink. ClickBank Tracking IDs. One way to make your ClickBank reporting even more useful is to attach Tracking IDs (also called TIDs) to your HopLinks. Tracking IDs are unique codes, up to 24 digits, that you create to identify your various promotional efforts. You can add these codes directly into your HopLink upon creating your HopLink in the Marketplace, or you can attach them to the end of your HopLink manually after it’s created. Google are always changing the rules about how they view websites. The latest ‘clamp-down’ is with DUPLICATE CONTENT. Google says it only wants the best quality sites so it will lower the rankings of any sites that use a lot of duplicate content. Out of all the sites that use the same content Google will rank the one which is best established and has the best backlinks, content and so on (often the original site from which the content has been copied). The rest of the sites will either be badly placed or even ignored. The best affiliate marketers write their OWN content by researching the material they are promoting. The lazy affiliates simply copy and paste. You CAN use any of the copy in these pages – but KEEP IN MIND it’s not really in YOUR BEST INTERESTS to simply copy and paste. Think of how many other affiliates will do the same! If you follow a few guidelines you can easily write your own content and stay friends with Mr Google. • All styles of piano covered – pop, blues, jazz, ballads, improvisation, classical. Then think of ideas (just write random sentences first) that will go with each HEADING ie. There are several ways that you can write your reviews. The expert – maybe you are a piano teacher or already have some musical background. The beginner – maybe you can share your journey of learning piano and what you thought of the various piano courses online. Maybe you have a music related site – you teach Guitar or singing or you discuss keyboards and so on and you ADD a review of the course to your site. This helps you come across as very genuine – in other words you are an expert and you endorse this piano product so it must be good. Piano practice can be fun too! Most people don’t really want to ‘learn’ to play the piano or ‘practice’ the piano, they just want to ‘play’ piano. ‘Play’ sounds like fun, ‘practice’ sounds like a chore. We get this image from childhood – some kid stuck indoors ‘practicing’ scales while all the other kids are outside the window ‘playing’. So, first thing we need to do is to see our piano practice in a new light. See it as a way of accelerating the learning process so that SOON you’ll be able to ‘play’ piano and play it well. If you don’t practice and you just play old familiar tunes you move rather slowly. Yes, you’ll get better at playing those old familiar tunes but technically you won’t be pushing yourself to greater heights. Proper, structured piano practice helps you stride forwards. I say ‘proper’ because a lot of people have an idea that practice IS just playing songs over and over. Practice needs to involve unchartered territory. The golden rule is – ‘practice what you CAN’T play, not what you CAN play’. First of all, work out what you want to achieve. Do you just want to know all your chords without thinking about how they are formed – then work out a practice routine that leads to that goal. Maybe you want to learn about inversions or chord substitution – again, make the practice fit the goal. Split your practice session into two halves. In the first half play the difficult stuff – your mind is sharper to begin with – then reward yourself with some enjoyable but reasonably difficult tunes. Make sure you are comfortable. Many a bad back has happened because of a bad piano stool at the wrong height. Make sure your piano is in tune. If you don’t have a good piano and are serious about learning GO BUY A GOOD ONE. Every fifteen minutes stretch your arms and shoulders and roll your neck to combat stiffness. Check out some Yoga exercises for shoulders and back. Follow the 3 times daily rule. Repetition in practice is ESSENTIAL. If you find something particularly difficult make sure you practice it at least 3 times every day. Don’t worry if it takes months to master – you’ll get there. Don’t play for the neighbours. Practice piano at a time when you don’t care who is listening so that you can make lot’s of mistakes and play things over and over. Organise your piano music carefully – don’t keep it in a heap where you keep playing the ones on top. If you download sheet music put it in a folder. Have plenty of shelves near the piano. Be realistic – I truly believe that anyone can learn piano and learn it to an enjoyable level but no two people are alike – some are more ‘naturally’ gifted than others. If you have an average ability then it’s all down to practice. The more you practice the more you learn. Now and then, practice with your eyes closed – or don’t look at the keys – this really sharpens you up. Organise your life so that practice is possible (this where Mindfulness comes in). Too many people think they don’t have time to practice when really they just haven’t found the time. How long should you practice – that’s up to what you want to achieve. You don’t have to be a concert pianist. Even if you just play for yourself just enjoy that. The archer who’s mind is on the prize cannot stay focussed on the target. Accept the bad days when it seems like you can’t play a note. Sometimes it’s better to walk away. So remember that ‘playing’ piano and ‘practicing’ piano are different. Which do you do? Aim for a bit of both. Which is better.. Keyboard or Piano? Real pianos are great but the one big drawback is you can’t turn the volume down so with a piano you tend to end up playing for the neighbours. With a keyboard you can stick on some headphones and play whatever turns you on – you can experiment, make mistakes and sound silly and play something a thousand times without driving other people nuts. Ideally – have BOTH! If you are buying a piano it is preferable to buy an overstrung piano not a straight strung! How to tell: Lift the top lid of the piano you should see the tuning pins at the top of the piano. If the tuning pins are evenly spaced along the pin block and the strings are all parallel and vertical this is a straight strung piano. If there is a group of tuning pins at the left and a separate group at the right and the strings cross over in a X shape this is an overstrung piano. Also get a tuner to check it out. I bought a piano once that needed to have the wood treated because all the pins (that tighten the strings) were coming loose very quickly after being tuned – disaster! What Keyboard should you choose? A lot depends on what you want. Do you want a keyboard that sounds and feels like a Piano – then you’re looking for a keyboard or Digital Piano with WEIGHTED keys. Listen carefully to the piano sound – don’t be bamboozled by all the other buttons. If you want something portable then you are looking for a keyboard. Personally I would still look for one with weighted keys – I hate the feel of light plastic keys. Get a keyboard with at least 61 keys – anything less and you will be craving for more keys after a few days. Also make sure get a sustain pedal, a keyboard is absolutely a dead thing without one. Without a sustain pedal as soon as you lift your finger off a key the sound stops dead – with a piano at least the strings vibrate for a second or two – the difference is quite noticeable. Below are some excerpts from the hundreds of testimonials on the Pianoforall site. You may want to include some or all of these on your site. Remember to point out that ALL these testimonials are VERIFIABLE (you can request the email of the person who wrote the testimonial) – No other website has this feature! This is why so many people trust that Pianoforall is the REAL DEAL. I’m amazed! Once you get the rhythms down, you really can sound like a pro! Great fun! Thanks for making this available at such a reasonable price. Anyone who doesn’t grab this up is going to go the long way home! Hey Robin, Just wanted to say thanks for this course. This is a great way to get up and running fast for song writing on the piano. I feel like I owe you more money. Hi Robin, A belated note to say a very big thank you for putting together such an interesting, motivating, straightforward approach to piano playing! I absolutely love the techniques, I’m playing everything now and it’s so exciting!!! I’m still only on Book 1 and I’ve learned so much already, I can’t imagine what you have in store for us in the other books. Dear Robin, I just wanted to Thank You for the incredible program that you have put together. I must say that you over delivered on this one. I couldn’t believe it, and neither could my wife! Within an hour, I was making music. My whole family can’t believe I really learned all I have in less than 3 days! I will tell everyone I know, who’s ever thought about playing piano or keys that this is the real deal and I hope if you use this testimonial that all who read it will believe me. “Hi Robin, Never thought I would say this I thought I had tried every method when it came to not only learning to play the piano but understanding the method.I am truly amazed at the progress I have made in THREE DAYS !!!! Your style is so easy to follow and the video along with the sheet music and the audio, no one could ask for anything more. Hi, I just wanted to say thank you for the fantastic Piano Tutor Books. I am nearing the end of the first book and can now confidently say this is the best tutor book I have ever come across. Hi Robin, Your course is everything that you and others said it would be. The lessons are do-able and satisfying. Your videos and sound bites make everything quite clear. I didn’t think I could make the piano sound this good so quickly. I would highly recommend your course to anyone who wants to learn the piano. Thanks so much. You are making a dream come true. Hi Robin, I recently purchased your product and I have to tell you: it’s absolutely wonderful!!! I’m still quite a beginner but I can follow your instructions and feel I improve daily! Though I have to admit I watch and listen to the videos thousands of times – but once it clicks in – it’s delightful. Thanks ever so much for your efforts of putting this whole set together, I’m really glad I’ve found you! Robin, Thank you so much for this course. I have wanted to learn to play my favorite instrument as long as I can remember. Now that I’m an adult, I am so glad to not have to learn from the child books. Already being able to play popular songs just amazes me! I am having so much fun. Hi Robin, just a quick note, this is david from barnegat, new jersey i started your course about three months ago, i am on book 3 and still think the course is just great. books 1 and 2 were just the best, i really look foward to sitting down at the piano now, and just have fun the licks and songs you use are just what i am looking for. i am 59 years young and grew up with all those tunes. keep up the great work and i will stay in touch, thanks again, david. Hey Robin we have spoke awhile back about your course..I started on book one and it is awesome.. I play acoustic guitar and sing but i am so excited to play piano now, and it so easy to create chord progressions with your method that the second day already im playing let it be progression…what is your suggestion should i just follow each page and dont move on till i master each page? Thanks..it was a blessing finding you, music is my life. We would like all our affiliates to be happy that they are promoting a great product. **with your unique Clickbank ID and a link to your website or possible promotional material** and we will send you the download information right away. If you have never heard of Affiliate marketing the basic idea is that you promote PIANOFORALL – via a personal website, social networking, word of mouth and so on – and for every person that signs up for the program through your recommendation (and using your link which contains your unique affiliate ID), YOU get 60% of the sale. But why would we do this? We can’t expect everyone to work hard at promoting PIANOFORALL without some reward for their efforts. So we give you 60% of each sale that comes via your efforts. That is only fair. Your hard work is rewarded and the people to whom you recommended the program get to live their dream. Everybody benefits. When Pianoforall first went online we had to use Google Ads in order to get any visitors at all. It takes quite a while before a site becomes established enough to get onto the first few pages of Google for the top keywords. Be prepared that most visitors stay for just ONE minute then go. Then try to figure out how to make them stay longer. Don’t expect immediate results. Once you place your ads don’t expect a flood of sales. Think about how you buy things online yourself. Let’s say you are buying a new laptop. You go to one or two sites – you check Amazon to see the reviews – then you may try a local website – then you may check to see if any other sites have any offers – then you may leave it and go back to the sites after a few days. As an affiliate you want the visitor to YOUR site to click through to Pianoforall – but if you fool them into doing that with a false link (that says ‘read more about Pianoforall here’) then they may just try another ‘review’ site for more answers and then that review site’s hoplink will replace yours. 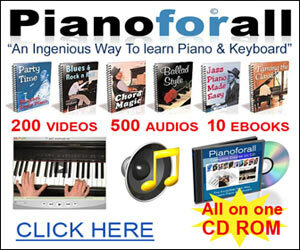 You need to be the LAST affiliate site they visit before they purchase from Pianoforall. Give the visitor EVERYTHING they need so that they don’t go somewhere else looking for answers. Negative keywords are keywords that can relate to two or more vastly different subjects which means that people may click on your ads who have no interest in your product. For instance – you might use the phrase “Learn Keyboard” – which would seem to be very relevant to learning a musical keyboard but lots of people may be wanting to learn to TYPE (using a keyboard) so they will mistakenly click on your ad costing you money. You may even want to go as far as putting the PRICE of the program in your ad – then only people who are prepared to PAY for piano lessons will click on it. People may use the word FREE in their ads thinking that that will get them a lot more clicks but people who want something free clearly aren’t wanting to pay for a piano course so they are not good customers. The keyword phrases below are some of the highest searched phrases on Google to do with learning piano. All of them will be very useful for Search Engine Optimisation but keep in mind that sometimes the top searched keywords aren’t always the ones that generate the most sales because there will be a LOT of competition for these keywords perhaps from sites that are well established and have more backlinks. I used these keyword phrases for a Google Ad campaign. I list them in order of highest ‘impressions’ first (impressions means the amount of people who searched using this phrase) Keep in mind that just because a lot of people search using a particular phrase doesn’t mean that this will result in more sales. You need to analyse your results to see which keywords are resulting in more sales. For instance, because Pianoforall is a chord based programme you may get more sales from keywords to do with learning piano chords. We are more than happy to help you in whatever way we can. Or EVEN if you just want to say ‘hi’ – it’s always nice to know the people who slave over those hot computer screens.